Home » Kitchen Help Category » Never used! 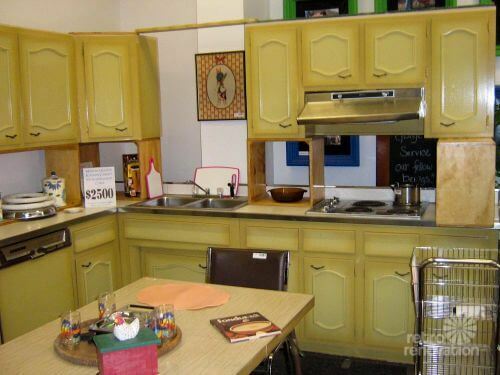 A 1960s harvest gold kitchen for sale in Worcester, Mass. Never used! A 1960s harvest gold kitchen for sale in Worcester, Mass. When I announced that Harvest Gold was Retro Renovation’s 2014 Color of the Year, I asked readers to be on the lookout for harvest gold kitchens for our archive. I’ve received many emails — thanks, all! 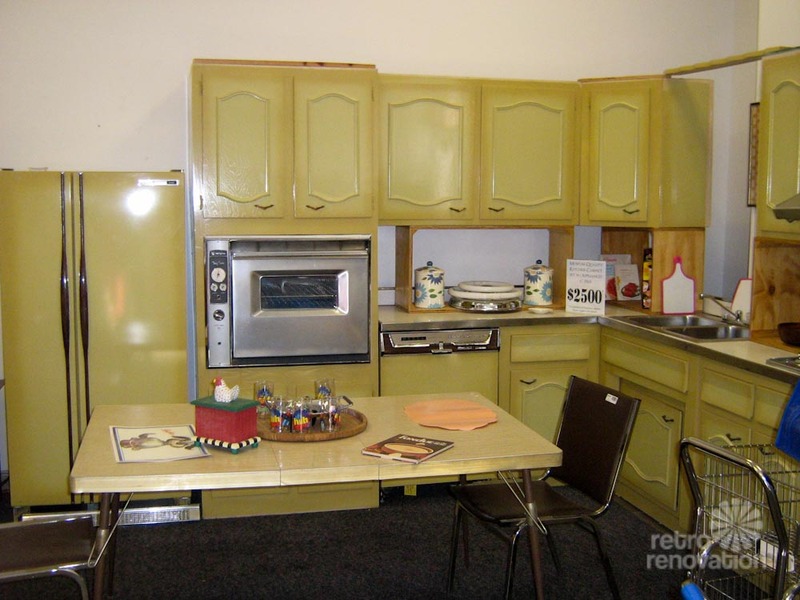 — but this one is particularly notable: Robin spotted a virtually unused harvest gold kitchen — complete with cabinets and all appliances — including a harvest gold refrigerator and dishwasher — for sale at the ReStore in Worcester, Mass. Remember “poppy red” kitchen appliances? I do not believe this kitchen is from 1963, as advertised. 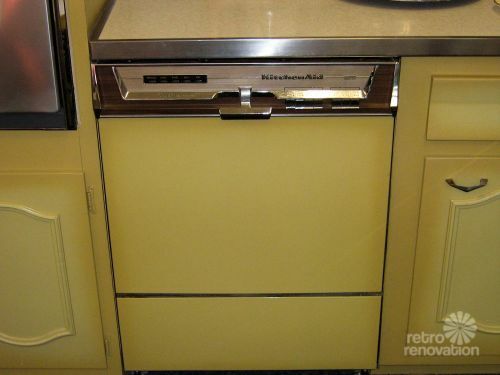 We did not see gold colors like this on kitchen appliances until 1968. And this one — with the shadowing around the edges: I’ll guess a few years later. In any case — what a fun find! You said you were looking for some harvest gold appliances? 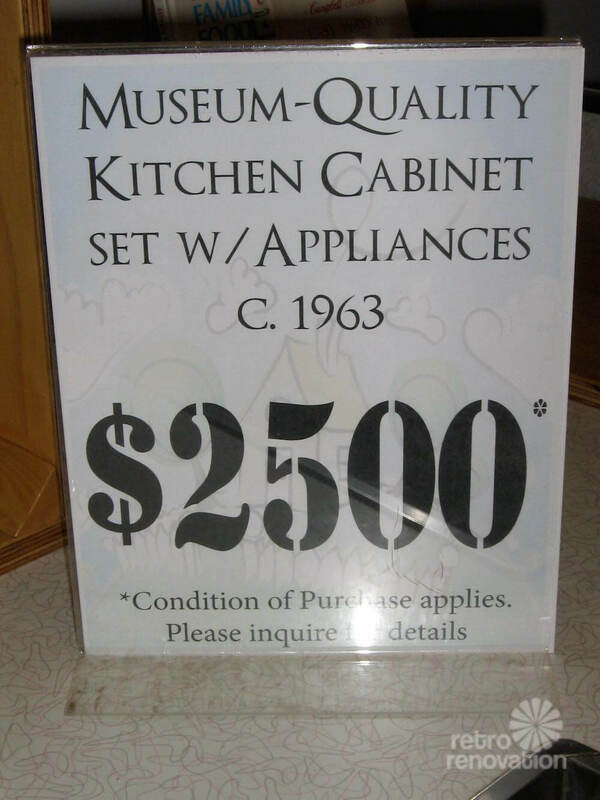 I live in Worcester, MA, and I’ve taken some awesome photos of a complete and UNUSED harvest gold kitchen from 1963 that our Restore in Worcester has for sale. 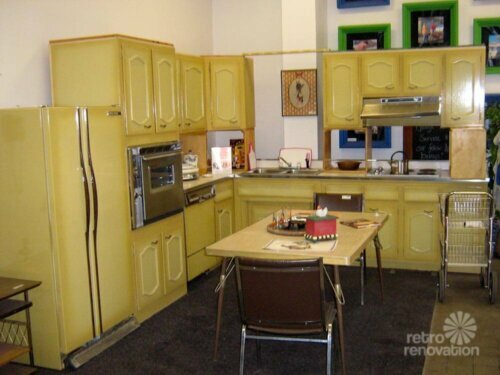 It’s a full suite of harvest gold wooden kitchen cabinets, harvest gold GE fridge and Kitchen Aid dishwasher. A chrome Westinghouse wall oven and cook top with NuTone range hood, stainless steel sink, and a brown/pink Wilsonart boomerang countertop and back splash with metal trim for the whole thing. They even have the original fluorescent ceiling fixture/light. The kitchen came out of a house in Worcester, and the Restore folks said it was a second kitchen in a finished basement that the owners had never used. 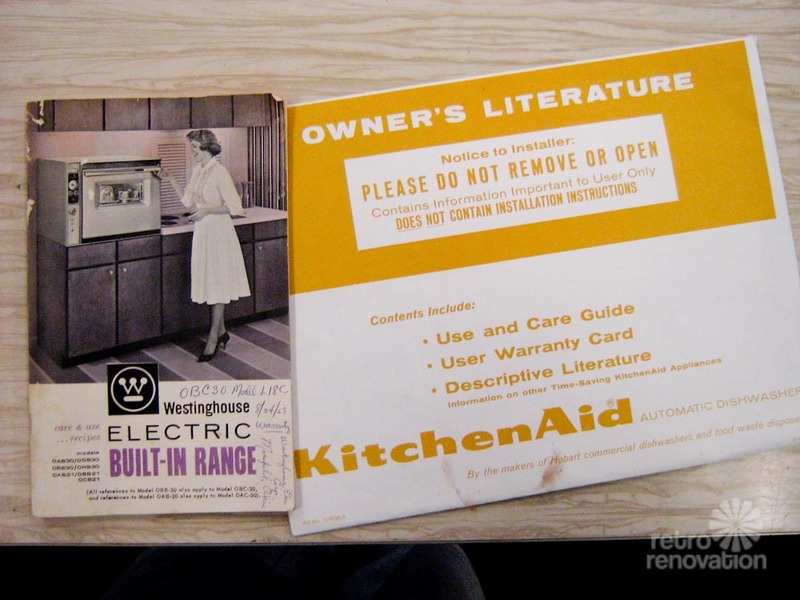 They even have the manuals for the appliances! It photographs beautifully because it’s not in pieces… they have it all staged as a room (IKEA style, if you’ve ever been). They even have a little 70’s era kitchen table and fondue set in front of it, and a teapot on the stove! Super cute. Thank you, Robin! It is so great to see the Worcester ReStore celebrating this kitchen for what it is — having fun and playing it up, rather than apologizing for it. 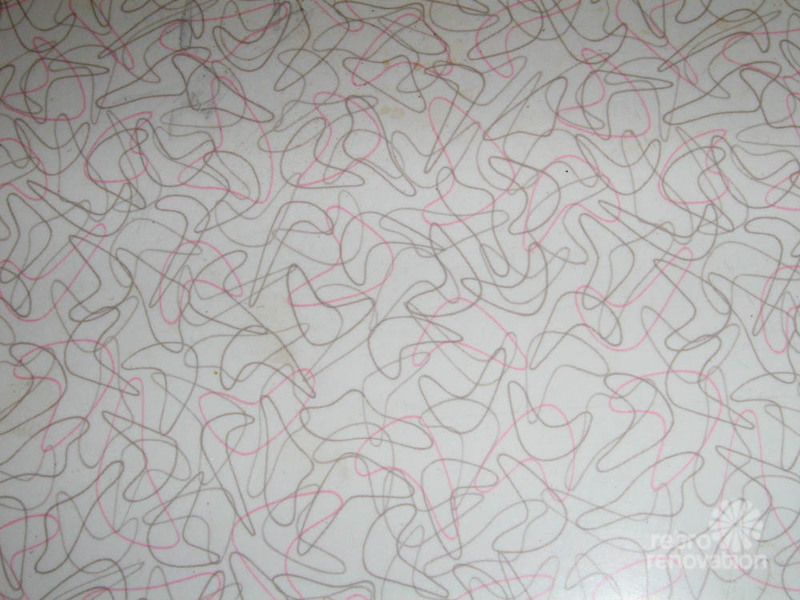 Above: Interesting that the boomerang laminate countertop does not seem to have any gold or even avocado in it. 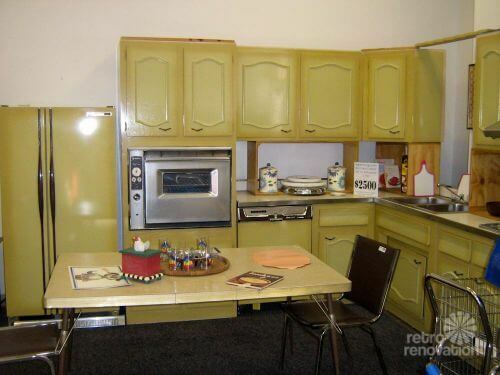 I wonder — if this was for a basement kitchen — if the homeowners just chose “what they liked” rather than trying to be matchy matchy decorator-like. Need boomerang laminate? 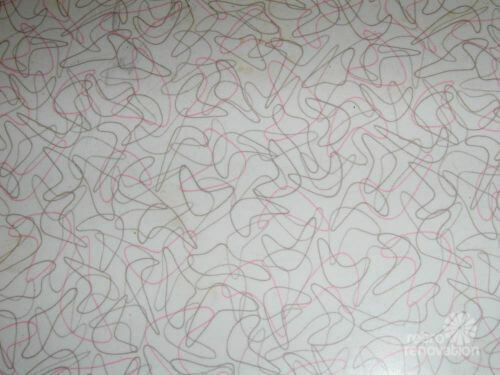 See our comprehensive research: 24 colors of boomerang laminate available today. 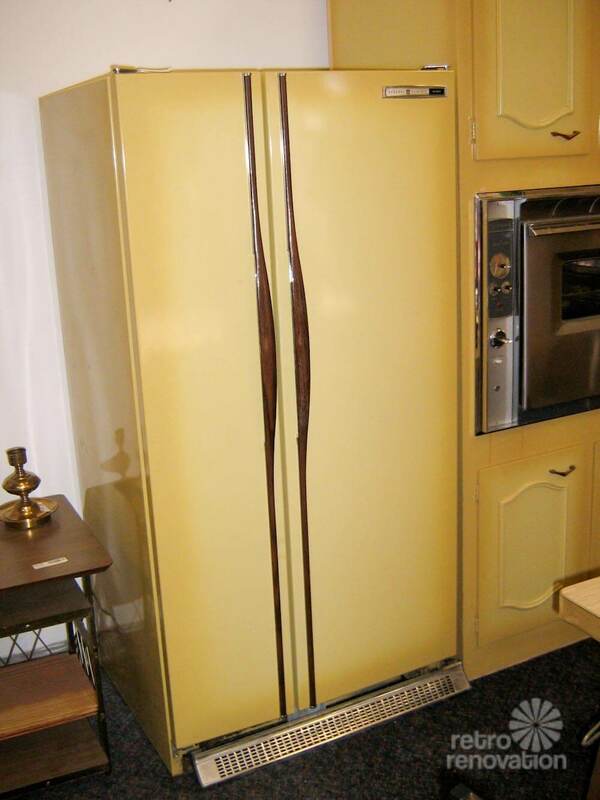 From what I *think* I now about old refrigerators, the one above likely is an energy hog. 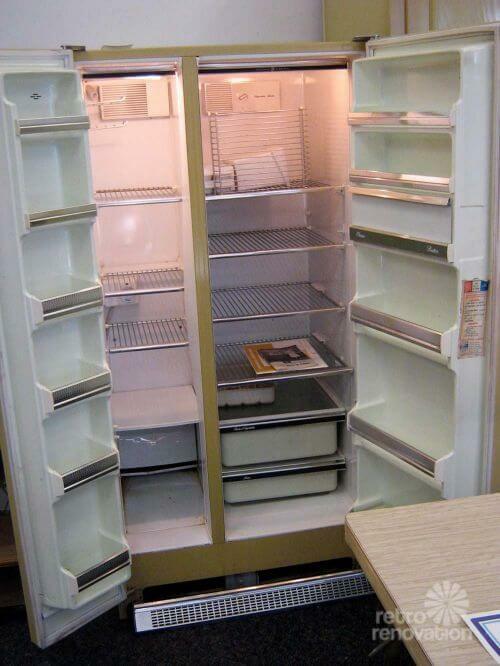 The key to high energy usage on old fridges: Does the freezer have automatic defrosting? If so, that’s what uses so much energy — the freezer compressor is turning off and on all the time to repeatedly defrost. Old refrigerator-freezers that DO NOT have automatic defrost may not use excessive energy. The only true test: Put it on a meter; don’t assume. Stainless steel wall oven. Yes: We do see stainless steel used on vintage appliances including all the way back to the 1950s. 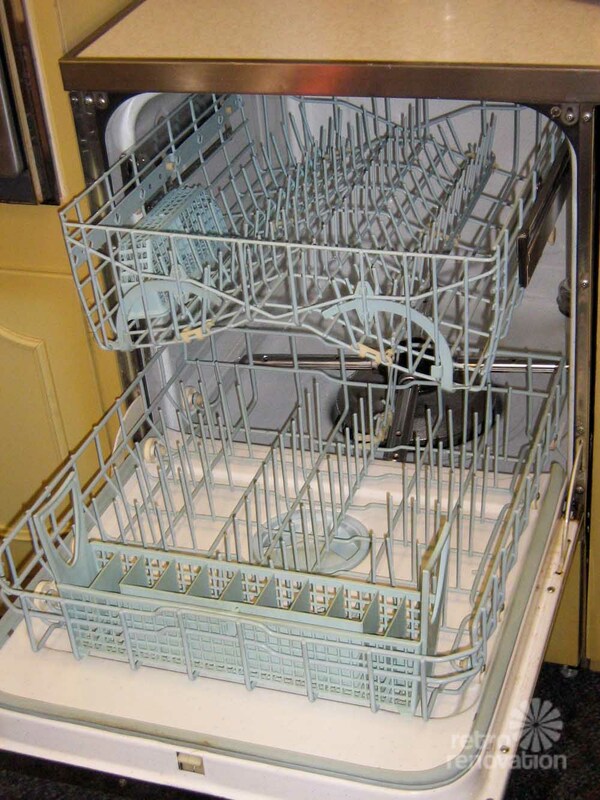 These old dishwashers were absolute WORK HORSES! Above: A classic “Circline” ceiling fixture. Throws a lotta light, I bet! 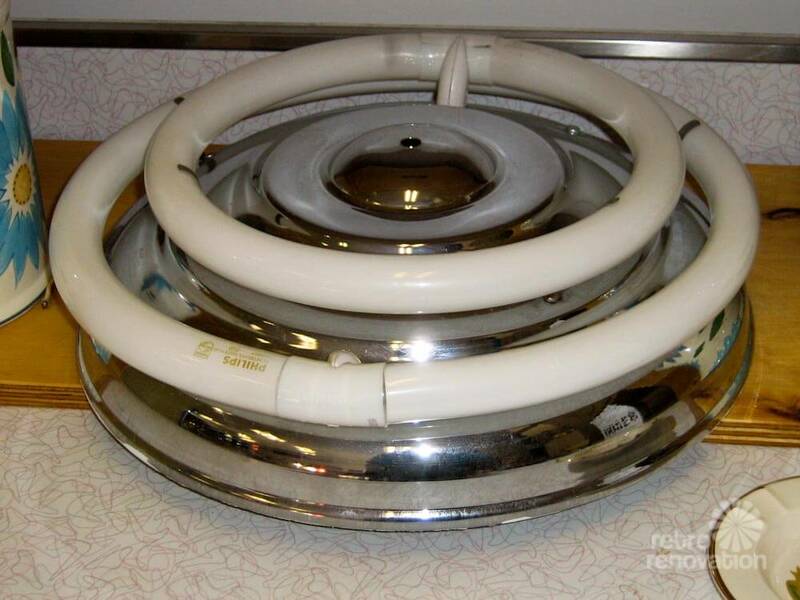 See some Circline lighting fixtures in a 1961 catalog. Do you want to paint something harvest gold? The first paint color I would test is the Harvest Gold in Sherwin-Williams’ Suburban Modern palette. Get the PDFs of this collection here. Thank you, Robin. I live only an hour and a half from Worcester. If I were a decorator with a warehouse, I’d drive on over and snap these up for sure for a future project. However, I’d probably try to deal re: price. It’s hard to fit someone else’s kitchen into yours… the refrigerator likely uses a lot of energy… and despite my adoration of vintage colors, it’s going to take a special buyer to understand and embrace this kitchen. Do you still have the frig? 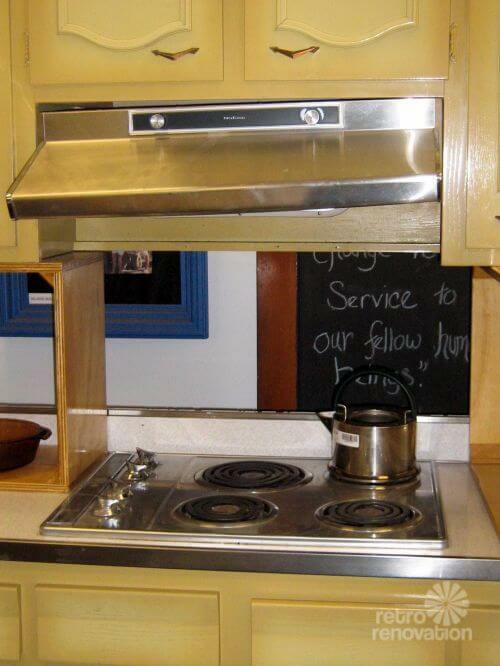 The kitchen and all of its appliances are long gone to a collector in Canada. The Fridge, apparently, was the sole reason he wanted the kitchen and would have gladly paid the entire kitchen amount just for the fridge…The unit was very rare and not many of its vintage (c. 1968) are left in working order anywhere. This Kitchen is featured in a newly released indie film “Aimy in a Cage”. Check it out and thanks for the query! My house is currently all harvest gold & in working condition. 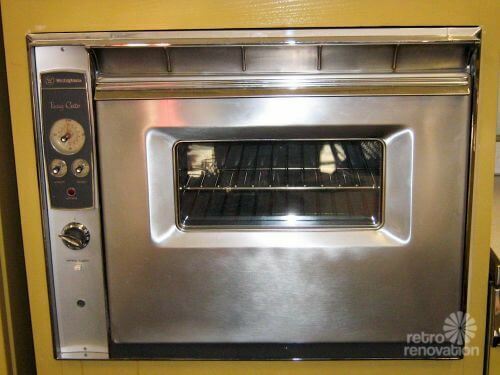 I use my appliances daily as a matter of fact my oven is in near mint condition. If you would still like pictures let me know as I would love to share. My kitchen still has the original appliances that were used when the house was first built.